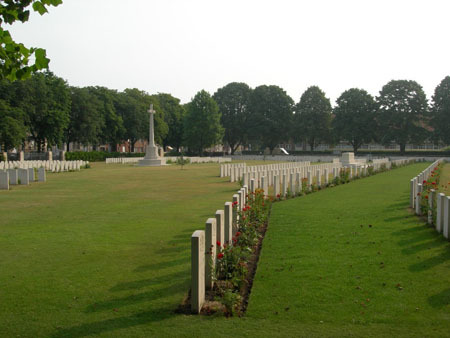 Died on the battlefields of Ypres serving his country. Ten years later, in 1911, he was now a 19 year old ironmongers assistant. He was still living with his parents and a brother, Frederick Cyril Haskins (what happened to him in WW1 ?) and two domestic servants at the 14 roomed Kenmore, Thrale Road, Streatham Park. There is a notice in The London Gazette on 7th April 1915 of his appointment as Second Lieutenant, on probation, in the 3rd Battalion, East Surrey Regiment. Although his service records are presumed destroyed, we know from his medal card that he entered France on 5th September 1915 and that 10 weeks later he was dead. 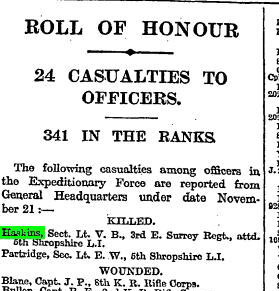 The above record from the Roll of War Service, Officers Training Corps, University of London, says he was killed in action on the Ypres battlefield. I have not been able to pinpoint any particular battle around that day.